Microinteractions is an essential guide to designing in today’s world where a typical person touches a hundred different user experiences each day, and only the clearest interactions will turn a new user experience into a cherished product. In this book, Dan Saffer turns the Cognitive Walkthrough on its head and takes it to the next level, creating a new model for defining interactions and illustrating the strength of designing for moments rather than systems. 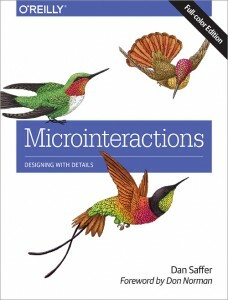 An easy jargon-free read and an invaluable reference, Microinteractions is packed with vital principles backed up by a wide spectrum of useful real-world examples of what to do, and what not to do. You’ll get something out of reading any two pages, and get even more out of reading them again. The book is an example of its own teachings. Approachable, but with deeper insights as needed. Saffer has written a excellent, compact, and eminently readable volume on a subject under-valued and under-discussed in our industry: the art and science of creating small, delightful moments in our daily interactions with technology. I recommend it to any designer or programmer looking to enhance the desirability and polish the utility of their apps, sites or services, one interaction at a time. 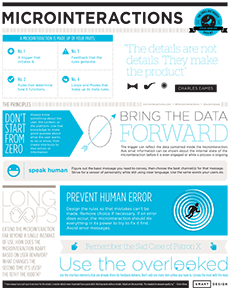 Dariel Fitzkee, the famous magician’s magician once stated, “Magic is both in the details and in the performance.” Interaction design is just like that. It is in reality creating a user illusion out of many tiny nuanced, interesting moments. Dan’s book, Microinteractions shines a magnifying glass on these moments and teases out how to go from a good to a great “user illusion.” I highly recommend this book to every designer and implementer of user experiences in any medium. I have never before seen a book drill down to this level of detail into how interactions (let alone microinteractions) actually work. It is one of the better books on interaction design I’ve read. I’m going to give copies to my designers and product managers and require that they read it and explain it back to me. With this book, Saffer’s new concept of microinteraction creates a valuable new design tool: filling in that vast middle ground between “Design Thinking” at the strategy level and “User Guidelines” at the very detailed level. It is an excellent book that should be read not only by designers but everyone involved in bringing a product to market.